Where does your target audience congregate online? The answer to that question is the first step in creating a social media marketing plan that attracts attention and engages your audience. The purpose of a social media marketing campaign is to get your audience interested in your business. Since internet users tend to have particular likes and dislikes, social media marketing must be carefully developed to engage, inform and entertain. If any of those three elements is missing, followers will quickly disappear. A certain amount of pop psychology must be employed and we can help you achieve that with fresh ideas, contagious content and custom-designed social media accounts to reflect your brand. Planting keywords that attract search engines such as Google, Yahoo!, and Bing involves more than using a specific word or phrase repeatedly. 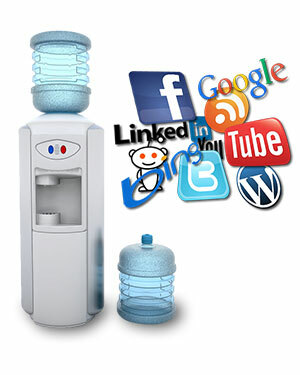 Social media marketing complements the SEO of your website through a process of link building. This can be counted in terms of shares, likes and favorited posts that lead back to your website. There are many ways to do this, but it is important to build these links through legitimate tactics. Credible and properly established links help search engines understand that your content is also credible, resulting in higher search engine rankings. Besides, search engines aren’t the only ones who need trust. Legitimate links and content builds trust within your audience causing them to develop loyalty and making them more likely to share you with others. At any given time, Facebook is still the most popular social media marketing platform among internet users. The site has (at last count) more than 900 million users. But Facebook isn’t the only social media marketing platform and it isn’t always the best one for your business. Other popular platforms include Twitter, Pinterest, and Instagram. In addition to these, there are hundreds of other platforms of varying popularity. Although YouTube is also a highly successful and very popular platform, posting information for others to view fits only a specific niche of certain types of business. Almost anyone can have a Facebook account and it is easy to post a wide variety of information including text, photos, videos, artwork and more. Pinterest is quickly becoming a popular platform or posting and browsing photos in every possible industry, though it is most popular among women. Each of the social media marketing platforms has its own benefits, disadvantages and preferred uses. Knowing which platform to use and how to maximize its benefits for your business is a specialty of our marketing team. Blogs are an important part of social media marketing and are a good way to post information about your business, discuss issues within your industry and inform audiences with news and articles that bring attention to your company. Not all businesses benefit from blogs, however, and taking the time to write informative and entertaining articles may not be within your means. Accurate and interesting articles take time to research and must be written to attract and hold onto the attention of your target audience. It can be easy to stray away from the blog content that is most beneficial to you. Our professional writers can help guide you with suggestions, appropriate content and fresh ideas to keep you on track.